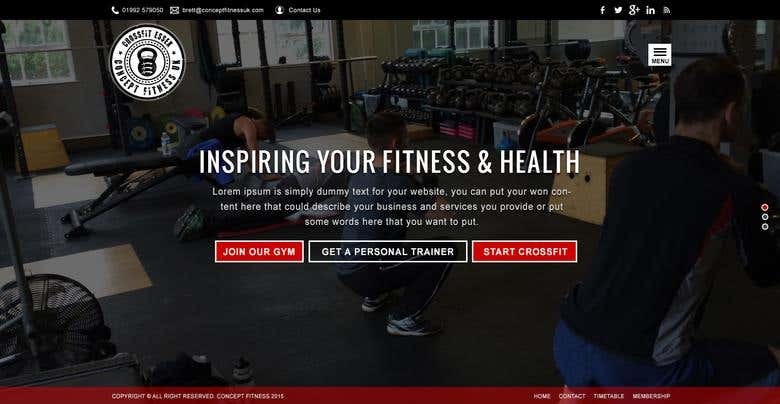 Recently we have designed this mock-up for CrossFit Fitness website. I am experienced web/graphic designer and art director, worked with Software design/development companies and have strong knowledge in: Website Design, Logo Design, Landing Page Design, Responsive/Bootstrap HTML, CSS, Word-Press Customization, E commerce Design, Social Media Pages Design, Banner/ Flyer/Business Card Design, Graphic Design, Image Editing etc. Why choose us? •	100% client satisfaction guaranteed. •	Provide help even after the project has been marked as Closed. •	Work 6 days a week and available online on CHAT 24x7 for any queries •	We understand your requirements precisely to deliver Creative designs •	Proper understanding of projects to ensure delivery within the desired time-frame I am always seeking new design challenges and ideas, looking to meet most client satisfaction and to create a fresh, eye-catching for every new project. I am looking forward to working with new people all over the world, and expand my experience and knowledge with each day.